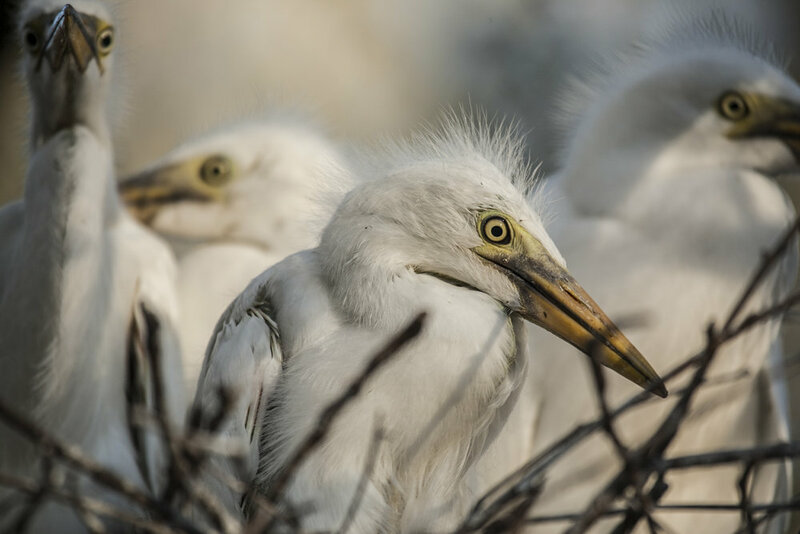 Rivers make up a mere half percent of the water on this planet, yet these environments harbor and support some of earth's greatest diversity. A true spectacle, these flowing environments host a teeming collage of colors, shapes and behaviors, harboring worlds and creatures beyond our imagination. 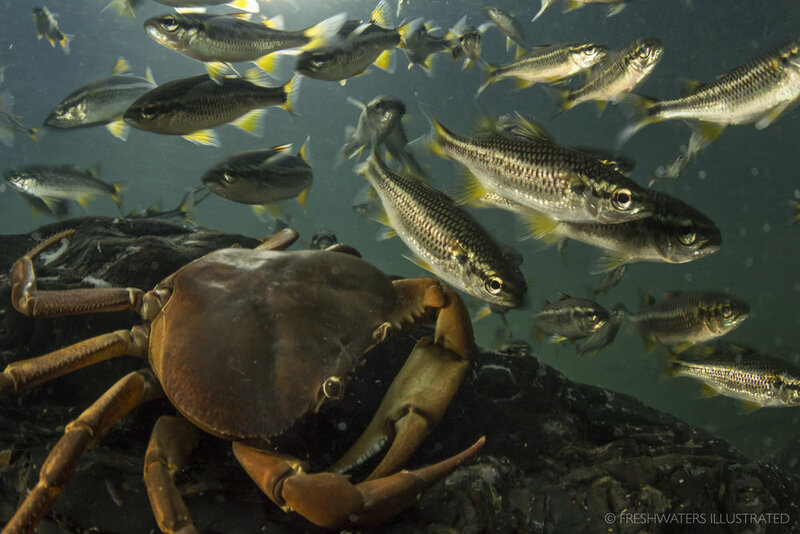 Exploring the life below, this gallery offers a rare window into the mysteries that lie beneath our rivers and streams. 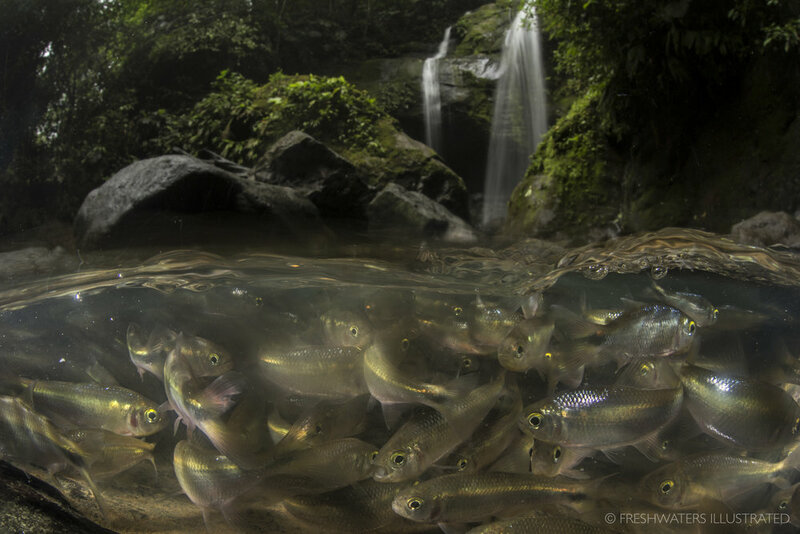 Large aggregation of spawning Tennessee Dace (Chrosomus tennesseensis). 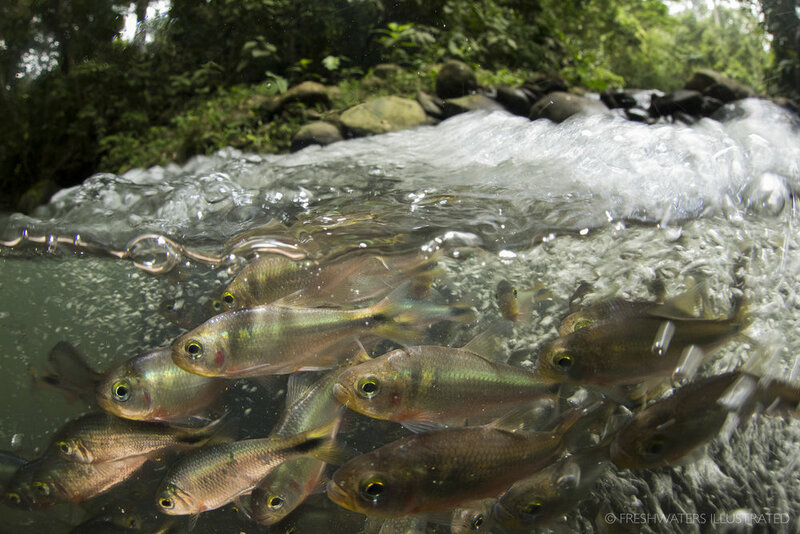 Schooling dajao (mountain mullet) in Puerto Rico’s free flowing Rio Mameyes. 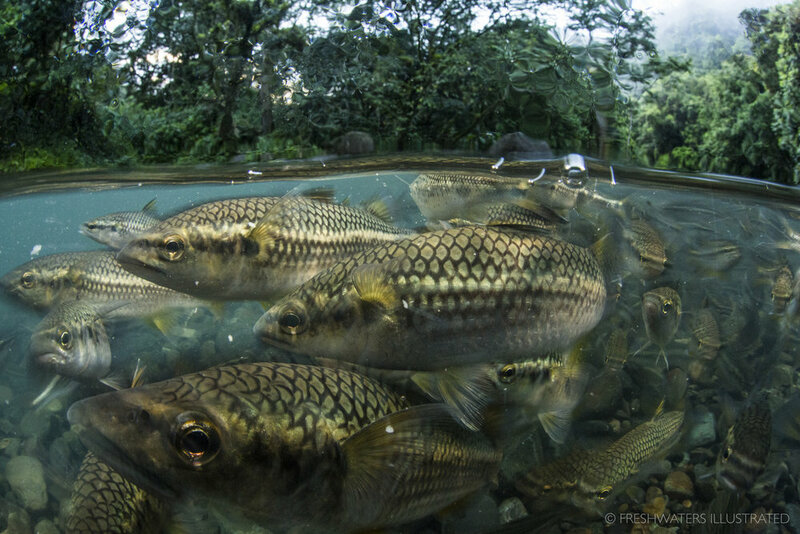 Designated as a wild and scenic river in the El Yunque National Forest, the Rio Mameyes supports an array of plant and animal life including five species of freshwater fish and nine species of freshwater shrimp. 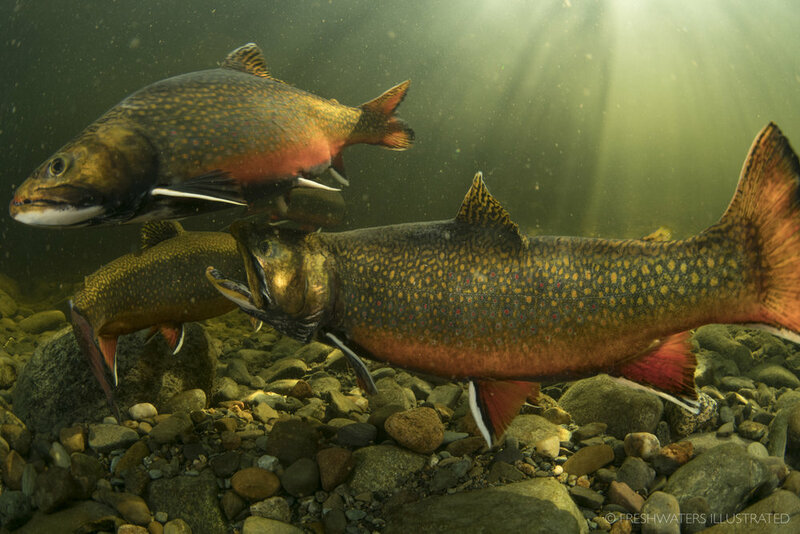 Two male Brook Trout (Salvelinus fontinalis) fight over the opportunity to spawn with a female. 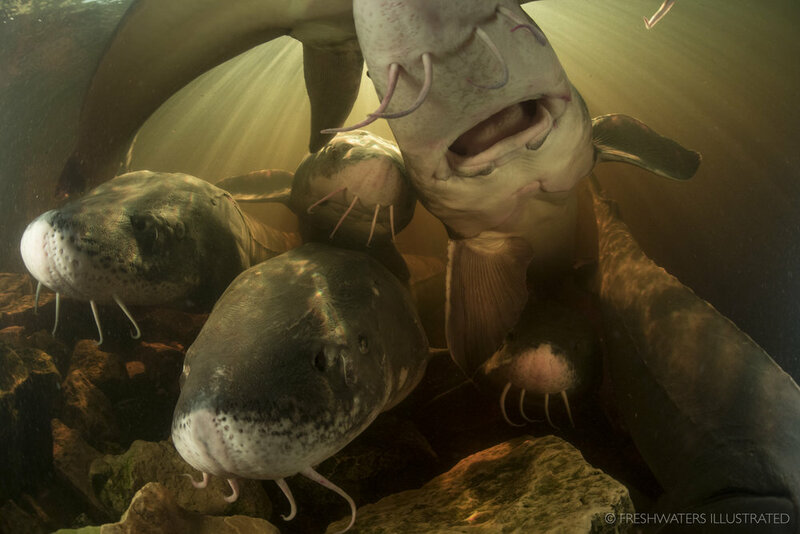 Each spring, as water temperatures rise on Wisconsin's wolf river, Lake sturgeon make their migration from lake Winnebago to their spawning waters. 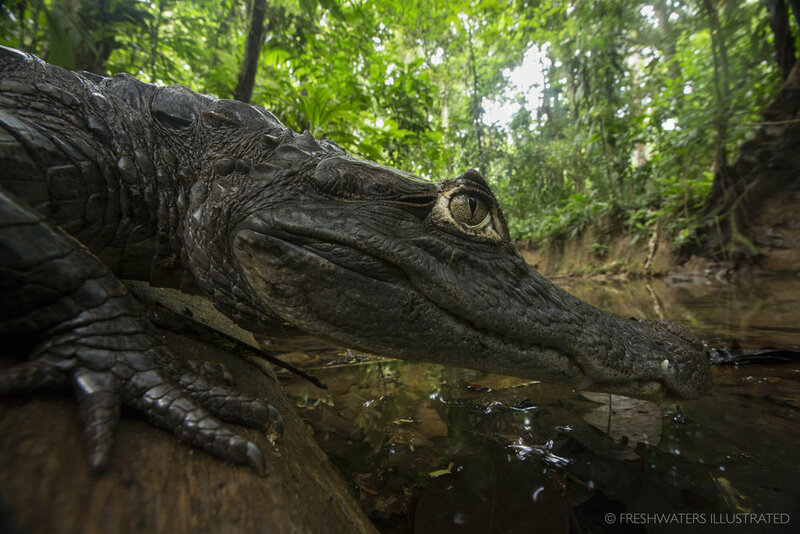 These ancient river giants can live up to 150 years old, and grow over six feet in length. 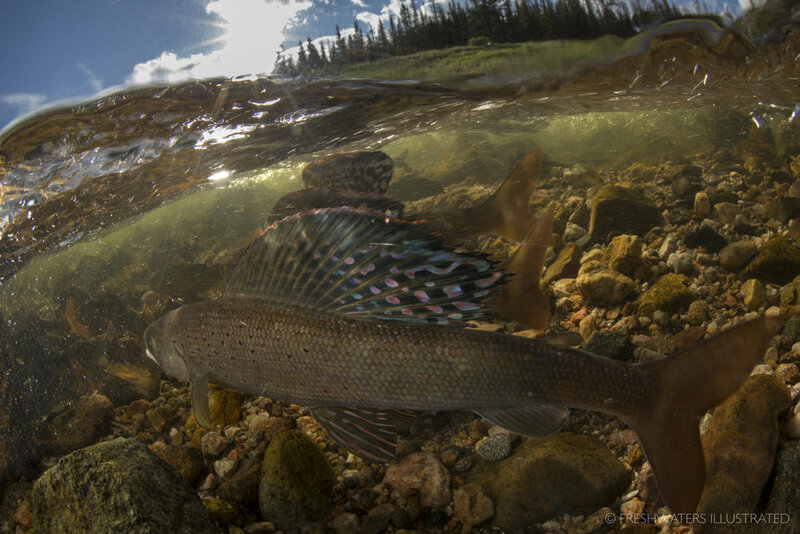 Male arctic grayling (Thymallus arcticus) raise thier large dorsal fins as they fight for prime spawning habitat. 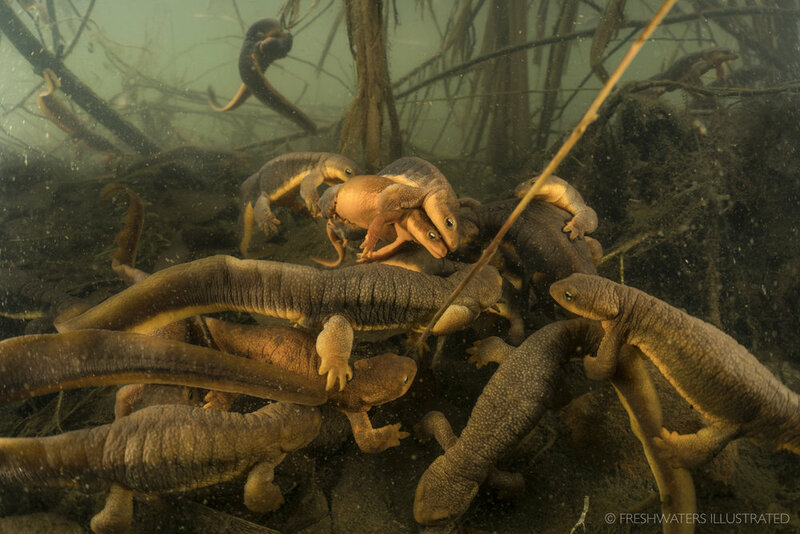 Large aggregation of spawning rough-skinned newts (Taricha granulosa). 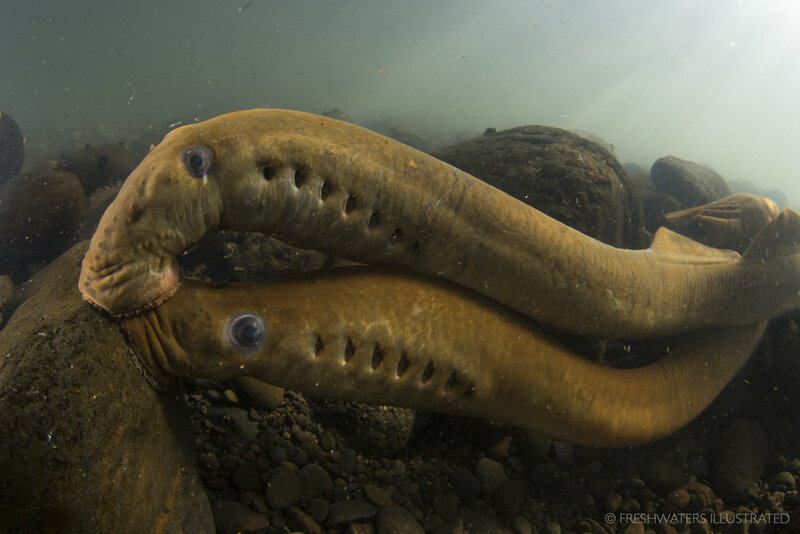 Pacific Lamprey (Lampetra tridentata) are the oldest living lineage of vertebrates, and have changed very little over the last 450 million years. 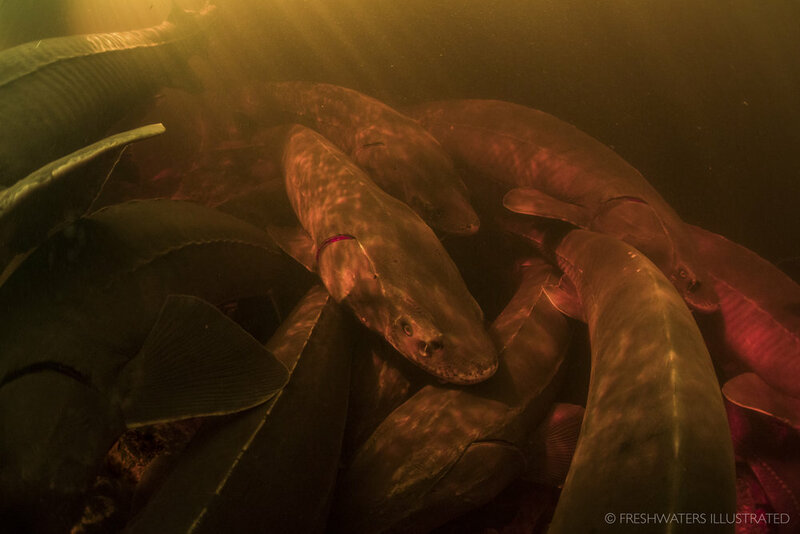 Unfortunately, dams and pollutants have caused populations of this ancient fish species to crash throughout much of its home range in the Pacific Northwest. The Willamette River is now the last strong refuge for this disappearing fish in the Columbia Basin. Each spring, as the dogwoods begin to bloom, thousands of buffalo migrate up-stream crowding into the small waters of Tennessee's Citico creek to spawn. 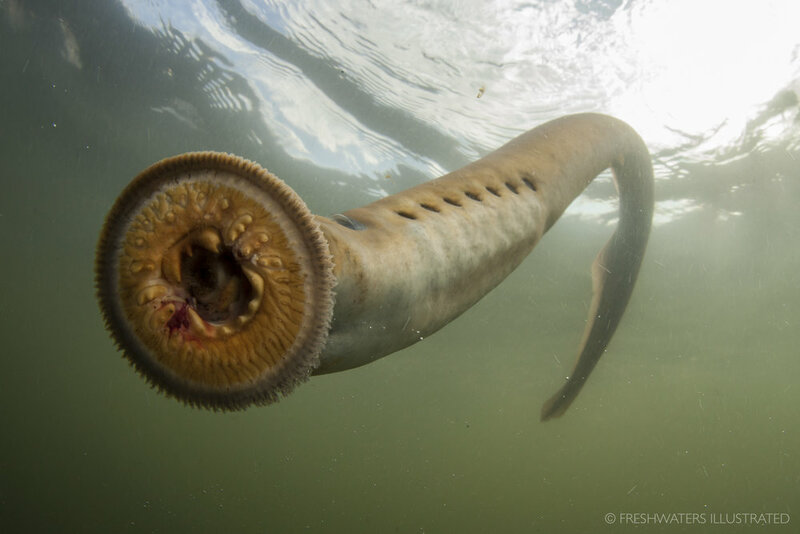 In just a few days these large suckers will release millions of eggs covering the stream floor with the next generation of buffalo. 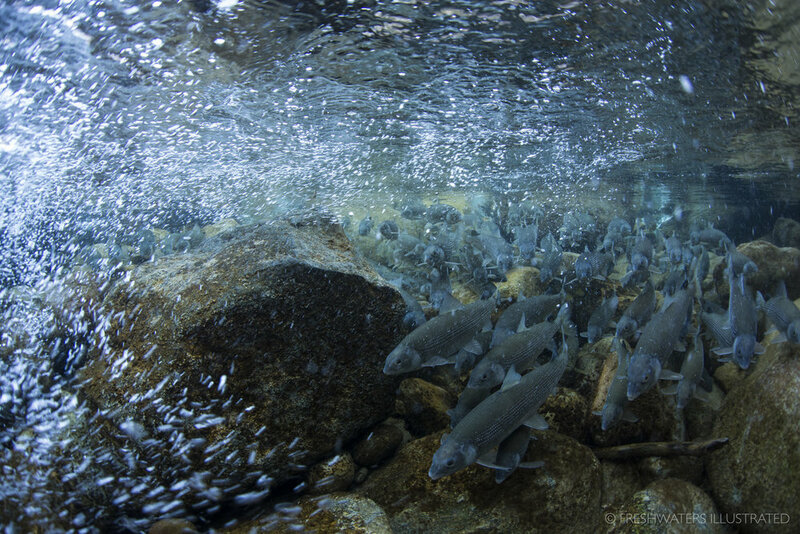 Swimming the line between chaos and grace a large aggregation of Colorado River Cutthroat trout arrive at their spawning grounds in an alpine lake of Colorado's high country. One of three remaining cutthroat subspecies found in Colorado, this native trout once occupied large portions of the upper parts of the Colorado river basin. Due to habitat loss and widespread introductions of non-native trout (rainbow trout, brown trout, and brook trout) populations of Colorado River cutthroat trout are now mostly confined to headwater streams and lakes. 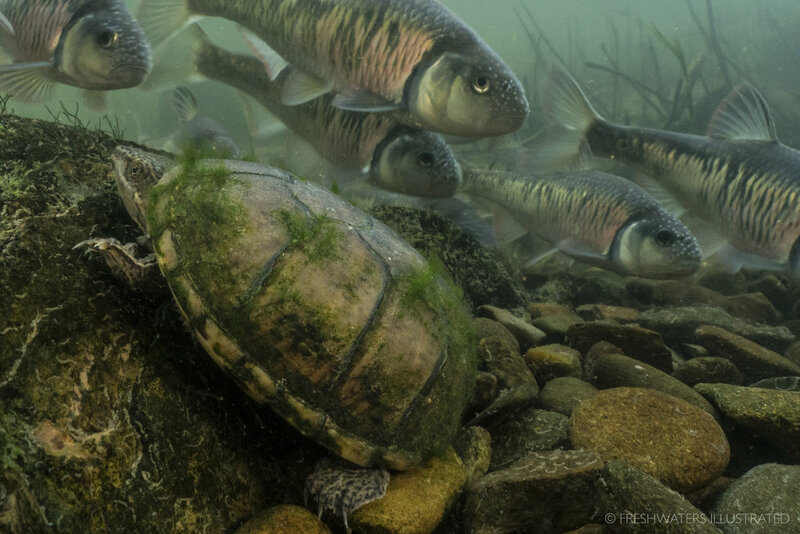 A curious musk turtle (Sternotherus odoratus) sneaks past a school of spawning striped shiners (Luxilus chrysocephalus). After migrating up from Wisconsin's Lake Winnebago, a pod of lake sturgeon spawn in the Wolf River. 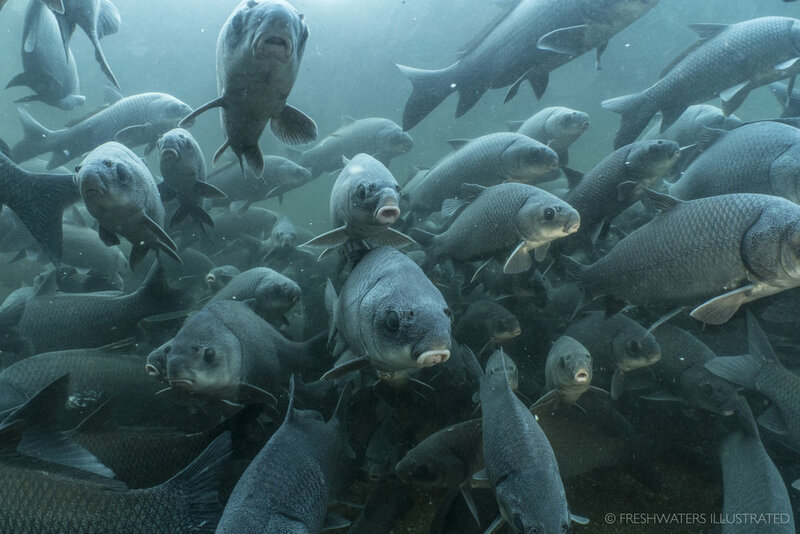 A curious gang of bluegill ham it up for the camera, as they harass a poor crayfish. One of the more inquistitve river critters found in the waters of North Easterm Oklahoma. 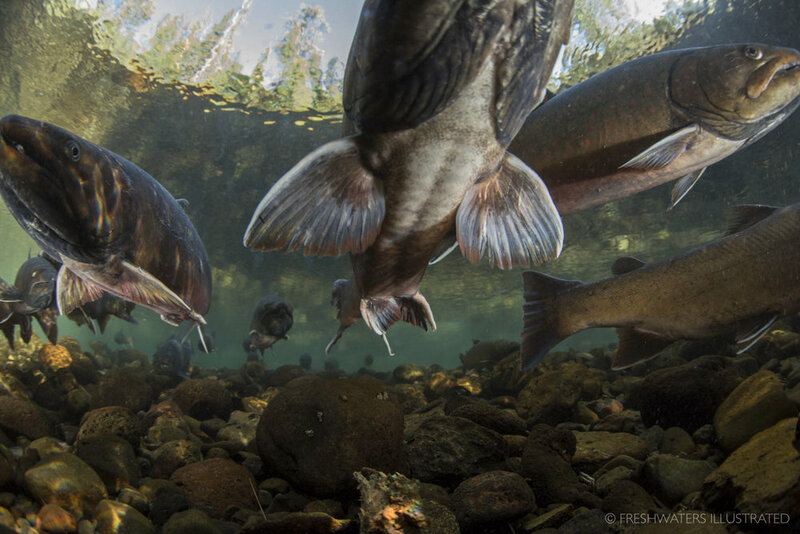 With power and grace, a school of large bull trout hold in a small headwater stream of Oregon’s Metolius River. Only enduring in the coldest, clearest, healthiest waters, these voracious predators are truly a symbol of a wild river’s perseverance. A male longear sunfish (Lepomis megalotis) flaunts his spawning colors, a maze of crimson red and metallic blue. A colorful male tangerine darter flaunts his spawning colors to a female. 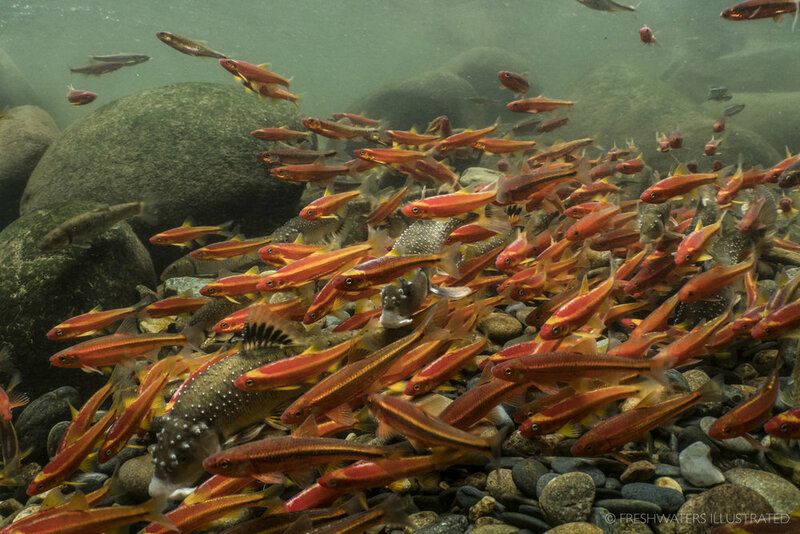 Amidst a blaze of spawning Saffron and Tennessee shiners male stonerollers work hard digging and defending pits on a river chub nest in the Great Smoky Mountains National Park. 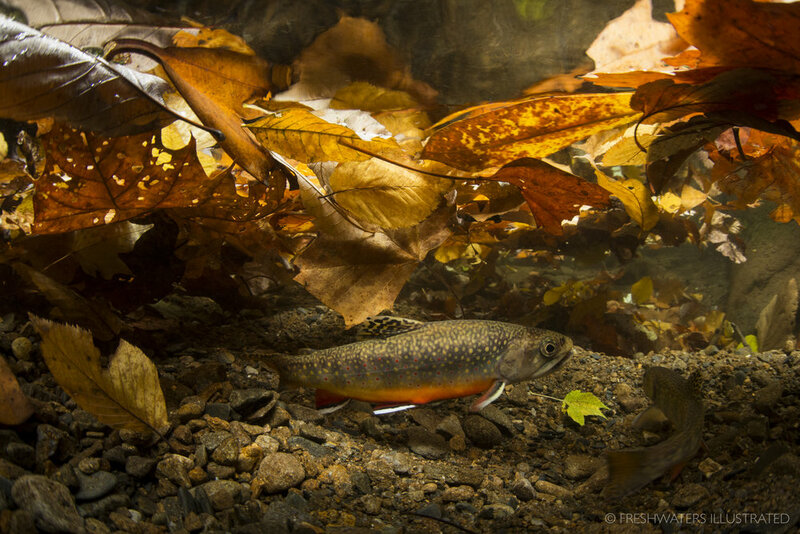 A Southern Appalachian brook trout hides within a layer of freshly fallen leaves in the Great Smoky Mountains National Park. Nearly wiped out, these iconic fish are now making a comeback. 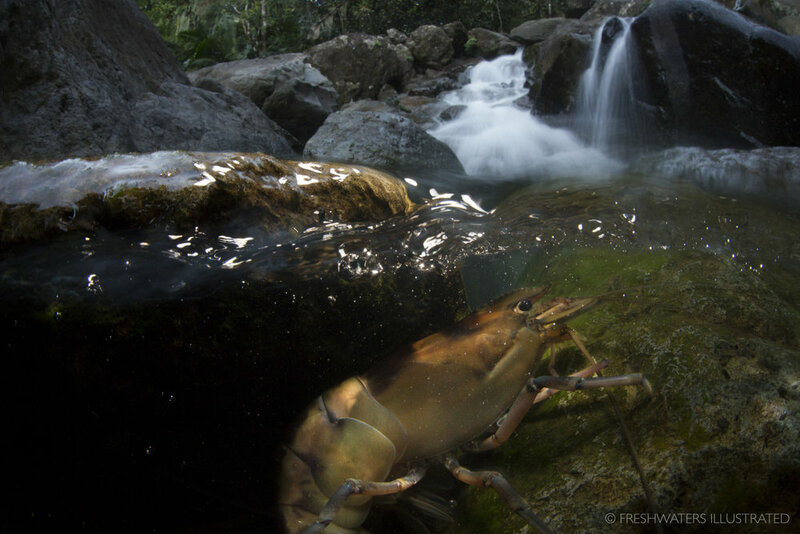 A large freshwater shrimp (Macrobrachium carcinus) precariously navigates up a small cascade in the headwaters of Puerto Rico's El Yunque National Forest. 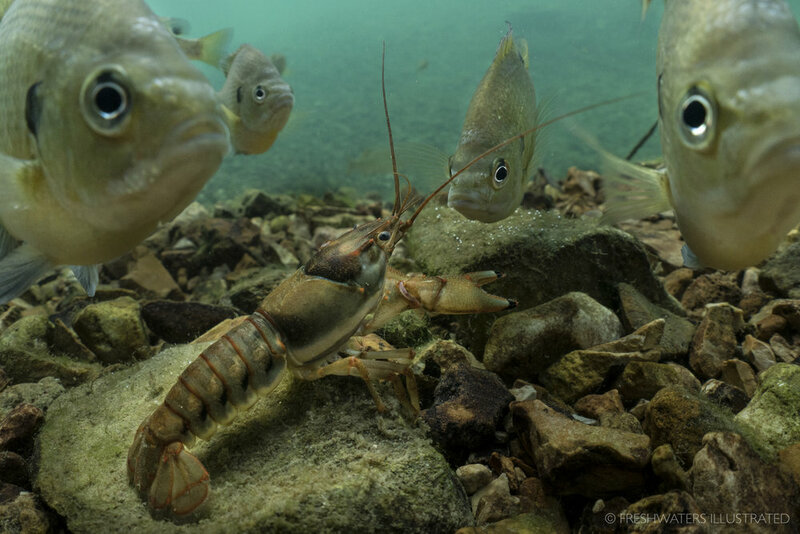 Home to 41 species of mussels (18 of which are endangered), over 100 species of fish, and a variety of other freshwater species, the Clinch river is among the most biodiverse rivers in North America. 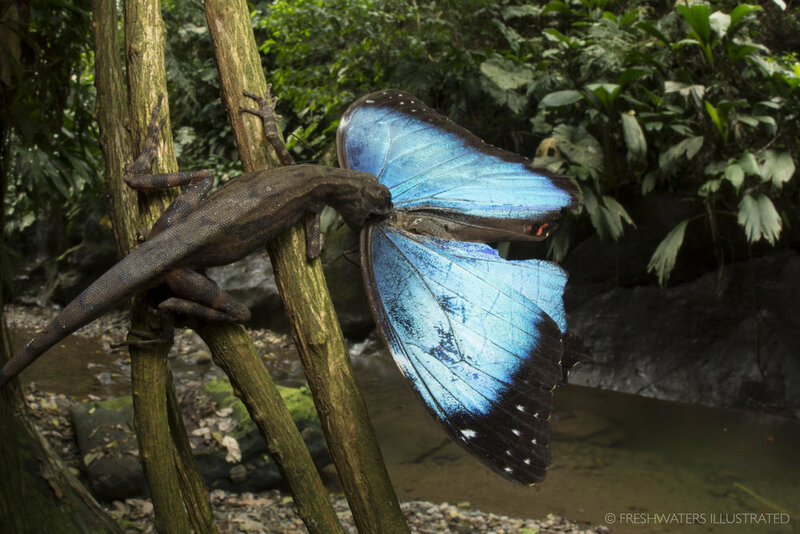 Unfortunately, much of this diversity is now under threat. From coal power plants to everyday trash, the health of the Clinch is severely impacted from a number of pollutants. Freshwater mussels also have some pretty interesting behaviors. 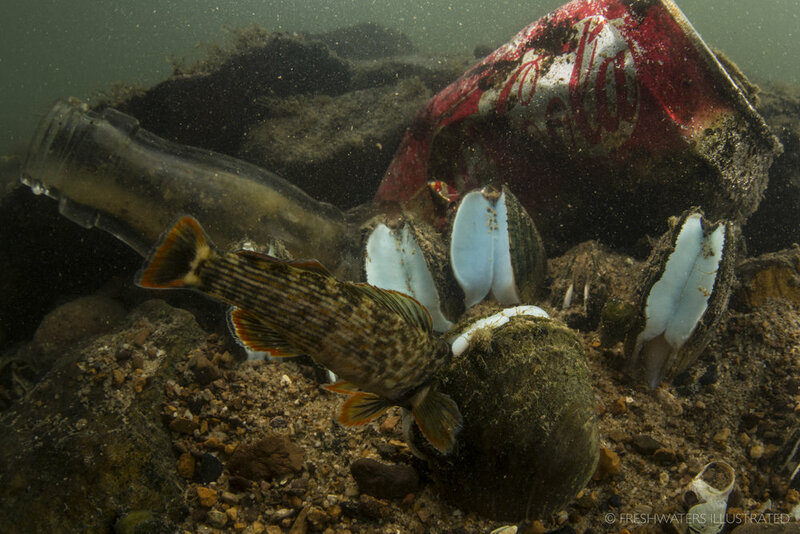 Here a female Oyster mussel (Epioblasma capsaeformis) has trapped a fish host using a modified lure. After trapping the fish, the female places her young mussels (glochidia) onto the gills of the fish to help distribute her young. 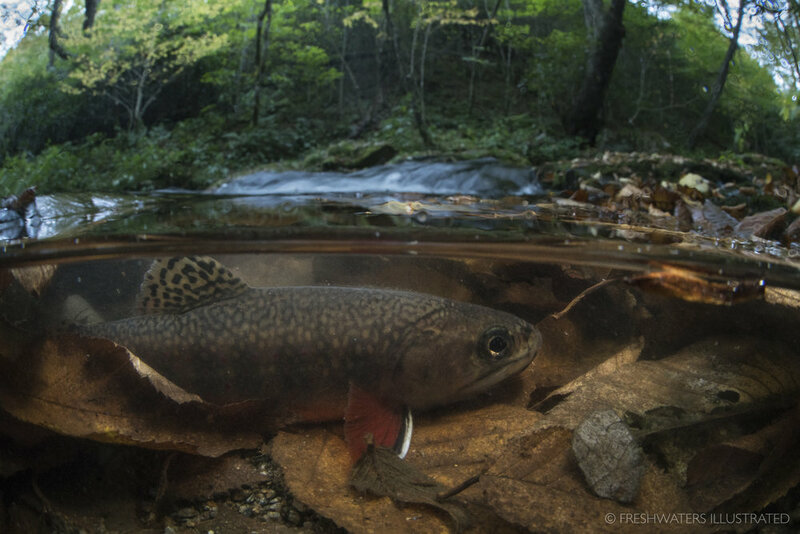 Hidden beneath a layer of freshly fallen leaves a pair of Southern Appalachian brook trout perform their annual mating courtship in the Great Smoky Mountains National Park. Nearly wiped out, these iconic fish are now making a comeback. Curious crabs and dancing dajao gracefully navigate the dynamic waterscapes of El Yunque National Forest's Rio Mameyes. 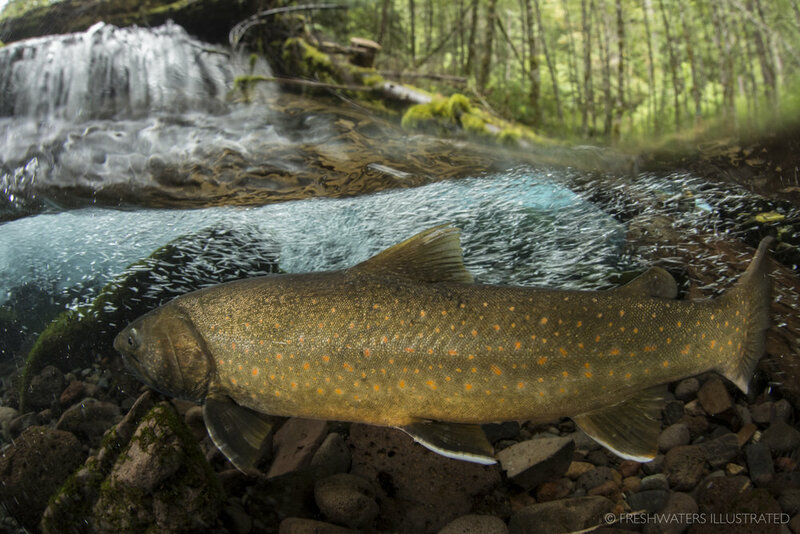 A large bull trout (Salvelinus confluentus) migrates up a headwater stream. Nestled along the meander of a high mountain meadow, a group of Colorado River Cutthroat Trout (Oncorhynchus clarki pleuriticus) carefully make their way through the snowmelt waters of Colorado's high country to spawn. 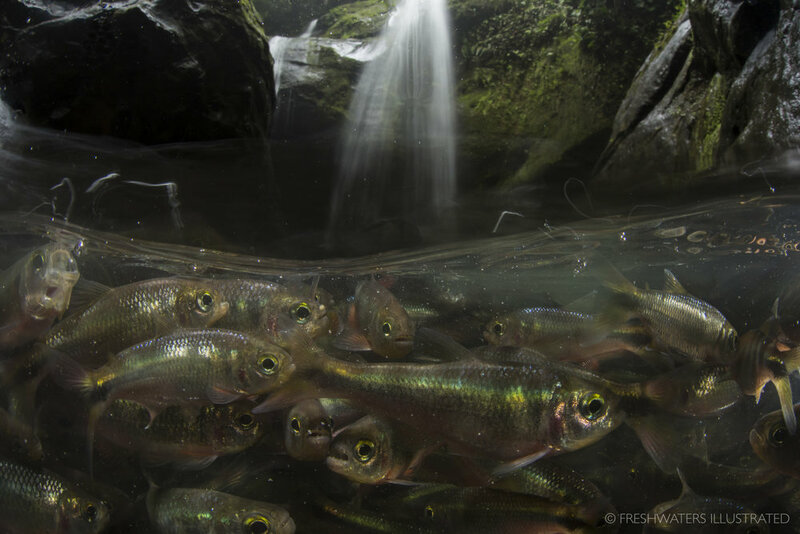 A large male bull trout (Salvelinus confluentus) fights the swift currents of a clear, cold Cascade spring stream. 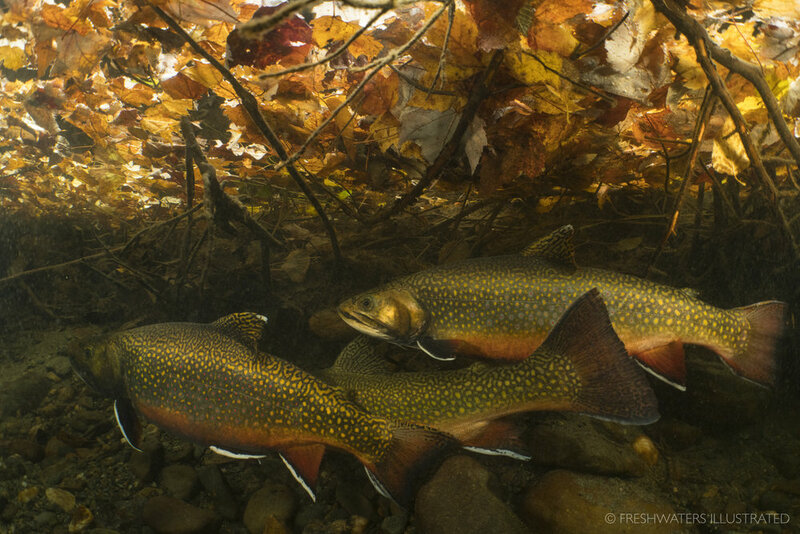 A Federally Threatened species, bull trout require the cleanest and coldest water to persist.